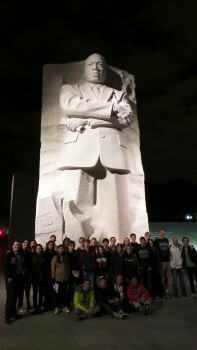 Postdoctoral Writing Fellow Paul Farber and his students at the Dr. Martin Luther King Jr. Memorial in Washington, D.C. The postdoctoral writing fellow curated a show at the Goethe-Institut in Washington, D.C., and brought students from his two writing seminars to the capital to experience it. Those experiences helped germinate a project that recently came to fruition: the exhibition The Wall in Our Heads: American Artists and the Berlin Wall, which Farber curated at the Goethe-Institut in Washington, D.C., as part of the recent commemoration of the 25th anniversary of the fall of the Wall. (The show opened Oct. 15, and runs through Dec. 15.) It gathers together the work of 23 American artists, including Nan Goldin, Keith Haring, and Public Enemy's Chuck D, who have all used the Berlin Wall as a site and symbol for weighing global forms of division. “From the Wall's construction in 1961 through its dismantling in 1989, and currently in its monumental afterlife, the Wall serves as a point of reflection for Americans' continued understandings of our own complex freedoms and challenges of democracy,” says Farber, who is also revising a full-length academic manuscript on the subject. Farber spent the last seven yearsâ€”both while finishing his dissertation as a doctoral fellow at the German Historical Institute and during his time here at Haverfordâ€”gathering references to the Berlin Wall in American culture, from books movies, music, art, and even advertising. It was important to him that the works in the exhibit not only document the historical periods of the Wall's development and demise, but also shed light on social divisions back in America, including racial segregation and the increasingly fortified U.S.–Mexico border. Thanks to support from the Center for Peace and Global Citizenship, Farber brought students from both of his seminars,“Memory, Monuments, and Urban Space” and“Cultural Approaches to Divided Cities,” to D.C. to view the exhibition and do field research in the capital. In just two days, the group visited the gallery at the Goethe-Institut, toured the National Mall at night, and spent time at the Dr. Martin Luther King Jr. Memorial, the Lincoln Memorial, and the Vietnam Veterans Memorial. They also took an“urban hike” to Meridian Hill Park with Steve Coleman of Washington Parks and People to talk through issues of urban transformation, division, memory, and gentrification. The Wall in Our Heads will come to campus next fall, where it will be remounted in the Cantor Fitzgerald Gallery, and Farber and some of his students will be involved in producing a companion pamphlet for that run based on the trip. Up next for Farber is American Rubble, a project that encompasses an on-campus residency with Wall in Our Heads artist Stephanie Syjuco, and a daylong symposium and temporary exhibition about the physical and social transformation of cities which will take place at Haverford on Dec. 5. In the spring Farber begins work on a co-curated civic engagement project, titled Monument Lab: Creative Speculations for Philadelphia, funded by a discovery grant from the Pew Center for Arts and Heritage, which will take place in May 2015 at Philadelphia's City Hall.